IN the back of a retail electrical store located in the skyscraper section of New York City, there is a unique club-room for radio amateurs. A full set of radio receiving equipment has been installed with an aerial on the roof. Apparatus can be tested out in actual practice, and the visiting amateur is given the privilege of taking any piece of apparatus from stock to connect up and use as he sees fit. The employees of the store make no attempt whatever to sell goods to the amateurs using the club-room. Even if the visitor asks for information, it is given without any intimation that he is expected to buy. Amateurs who live many miles apart and who know each other only via wireless, form a habit of dropping into the club and talking over their installations. If one has a new idea in hook-ups, there is a chance to test it out. If a newcomer wishes to learn the standard connections, there are blueprints on the walls. If a “club member” has a theory of radio to demonstrate, he can step to the blackboard and sketch it out with the other amateurs present giving criticism and argument. Sometimes, if one is lucky, one may meet some of the experts from the big wireless companies, and get the latest “dope” direct. By promoting interest in radio, the clubroom has proved a moneymaker for the store. The goods sell themselves, for by listening to the conversations in the clubroom the beginner in wireless finds out what he needs for a first class station, and goes out into the store and buys it. 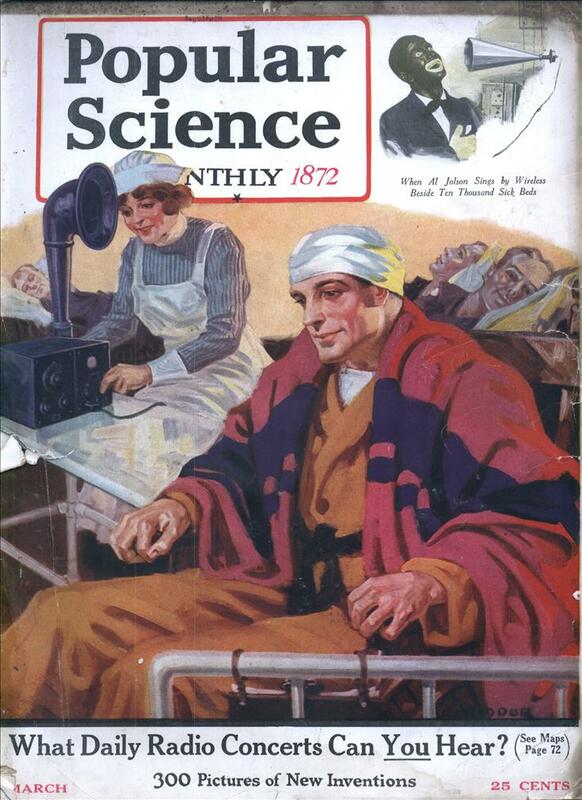 He has learned the right name, too, and does not waste the clerks’ time nor compel the salesman to give a curtain lecture on electricity and magnetism every time a receiver is sold. 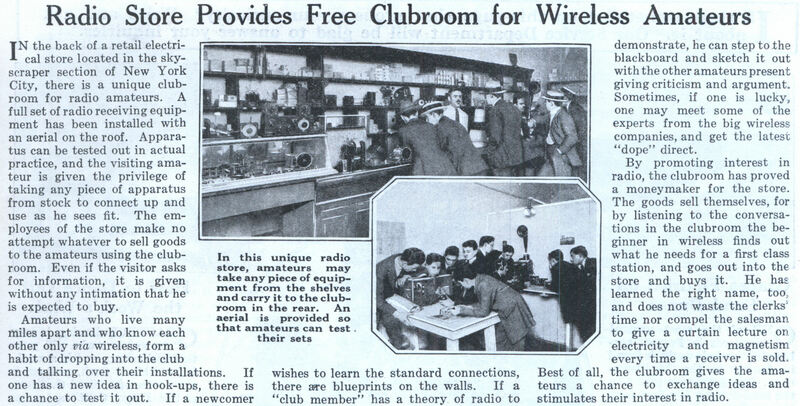 Best of all, the clubroom gives the amateurs a chance to exchange ideas and stimulates their interest in radio. Something similar did exist for consumer electronics in Germany. A (now defunct) company called Grundig used to have a whole luxurious store where you could try out all their products and even ask questions about them to your hearts content. The only thing you couldn’t do there was to buy them. @ Andrew L. Ayers – Yep, Hams were the first Hackers after all. so ultimately everything purchased ended up being used goods???? Hummm, bring my broken gear to the club, test some test equipment, decide I don’t like them, go home and fix my gear. Unless I fixed it testing the test equipment. I guess customers were just more considerate back them.